Over the Rainbow: My triumphant return....and a layout! a very cute layout keshet, and the letter is a neat idea! Love this idea for a LO! So touching. And love the pretty page too. Yes, I did a similar LO once. welcome back! :) by the way, thanks for the well wishes with my move. its taking me a while to get back into crafting & blogging since i'm working a lot to try to make up for the moving expenses, but your layout is definitely inspirational! i think i'll make one with a letter to my future self...soon! 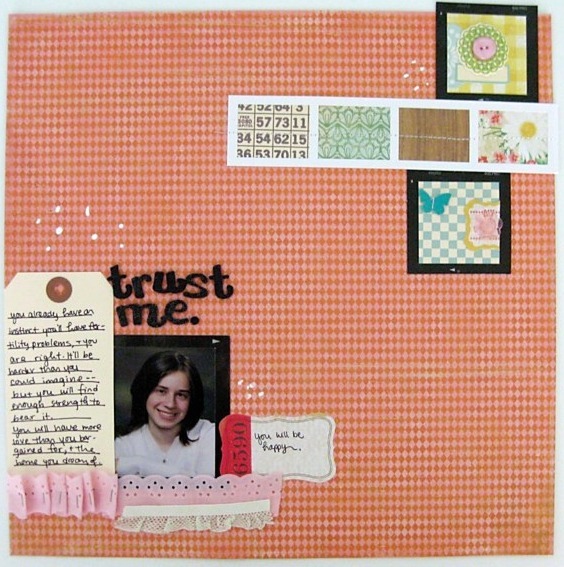 lovely page and your journalling so moving! I hope and pray you become a parent and you find the strength to achieve your goal!! i have been thinking about writing a letter to my younger self, but i am hesitant and i don´tknow why. maybe it should be my summer challenge?! What a great layout and a great way to document your feelings. Welcome to Mac land! Love the layout and the personal journaling! Thanks for sharing! Your layout is full of heart! I haven't written a letter to my younger self, but it would be interesting to do! Cute layout! love the lace! I didn't do quite the same thing-I didn't write a letter. But, I just made and posted a layout about a photo of me and my husband when we were engaged. And I had the same source of inspiration--what would I tell them if I could? I love the letter though. What a great way to reflect upon who you were way back when, and where you are now. Wonderful LO and I love my MAC - it takes a minute, but once you bite the Apple......lol!!! Hey Keshet, found your blog over at SC. Your LO really struck me, because I had those SAME thoughts back in college... and sure enough... Hugs to you. Thanks for visiting my blog... I love yours and unfortunately I never did write myself a letter. Love the layout and that cute picture of you. and I just followed you on pinterest. that place is so inspirational.